A ten minute boat ride can transport you to another time – probably the 1960s. Pulau Ubin – where time seems to have paused – is a true relic from the past as compared to its rich sister Singapore. Consciously preserved in true kampong (village) style, the boomerang shaped island is a popular weekend day trip destination for many high-rise city dwellers of Singapore. Just off the northeastern coast of the main island of Singapore is Pulau Ubin. Its humble surroundings are a complete contrast from the well-manicured environs of Singapore’s mainland. Pulau Ubin had been on our to-do list for a while now. So on a hot and humid Saturday morning (can’t get a better day as this is the typical Singaporean weather), we head to Changi Ferry Terminal to catch a bumboat ride to Pulau Ubin. Within ten minutes we were transported to Pulau Ubin Jetty. To explore the island, you can rent a bicycle, walk or hire a minivan (suitable for bigger groups or people with elderly /infants). The best way is to explore on a cycle as walking can be a lot more tedious and time consuming. 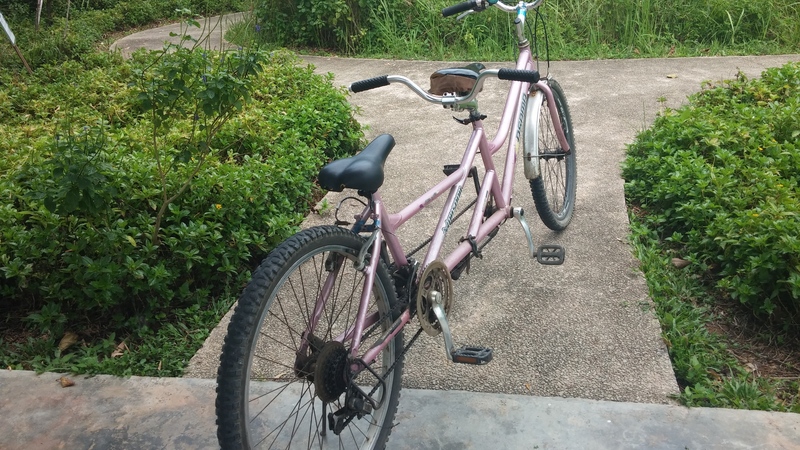 We rented a tandem cycle to explore the island for SGD 12. 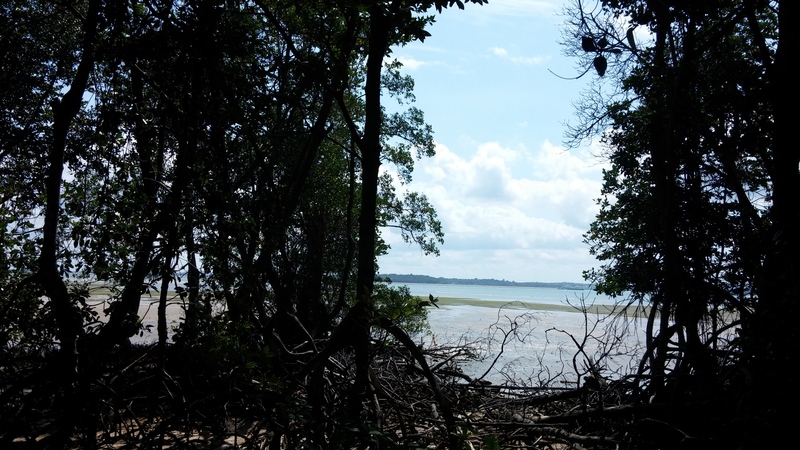 We grabbed a map of the island and decided to begin with Chek Jawa Wetlands. The island has proper signboards so it’s easy to navigate. After cycling for about 10 minutes we reached a point where the terrain gets hilly and rough. We embarked on it thinking we will reach the wetlands in no time. But it took quite a while as the terrain was uneven. There were times when we had to push the bike and tomes when we had to ride with caution, especially the steep slopes. After reaching Chek Jawa Visitor centre, we parked our cycle at the designated spot and walked to the Broadwalk that leads you to the mangroves. The Broadwalk is a proper wooden pathway taking you in between the mangroves into the sea. 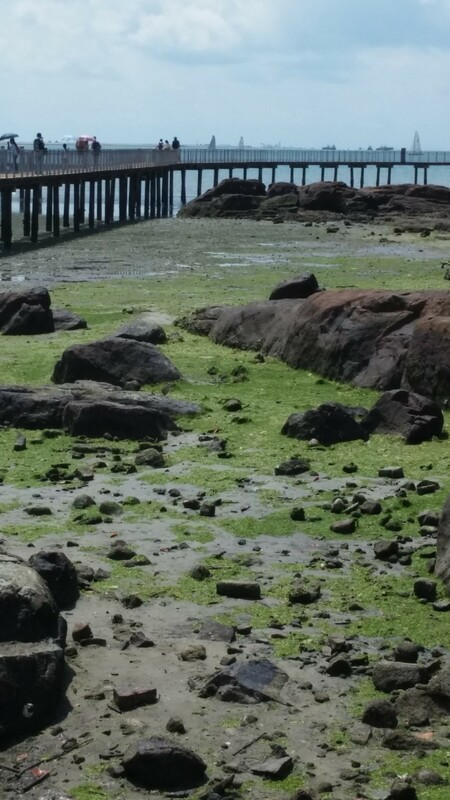 Since it was low tide, we saw some marine life tiny crabs, fishes and some other creatures that I didn’t recognize. We were told, if you are lucky you may see star fishes too. Since it was a weekend, there was a lot of people. After our walk along the sea, we resumed our cycling. Next stop was at the Balan Quarry. 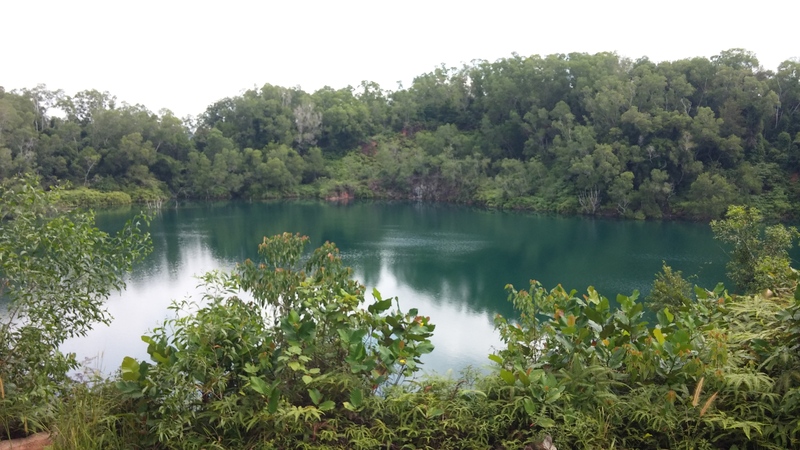 Pualu Ubin had many granite quarries in the yesteryears. Now mining is banned and the quarries have filled with rainwater, transforming into picturesque lakes. The Balan Quarry is located near Chek Jawa. 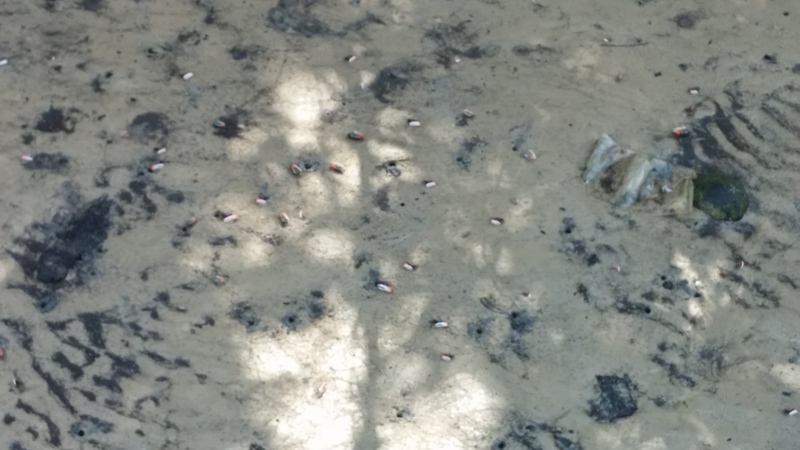 However, swimming and fishing are not allowed in Balan Quarry as well as the other quarries in the island. We cycled across the island and visited other spots such as the Sensory Trail, Butterfly Hill, etc. The island also has many campsites such as Noordin and Mamam but some of them have been closed due to soil erosion. At about half past noon we decided to head back to Ubin town area for our lunch. We chose Season Live Seafood and treated ourselves to some honey glazed prawns and later a steamed Hong Kong styled fish. 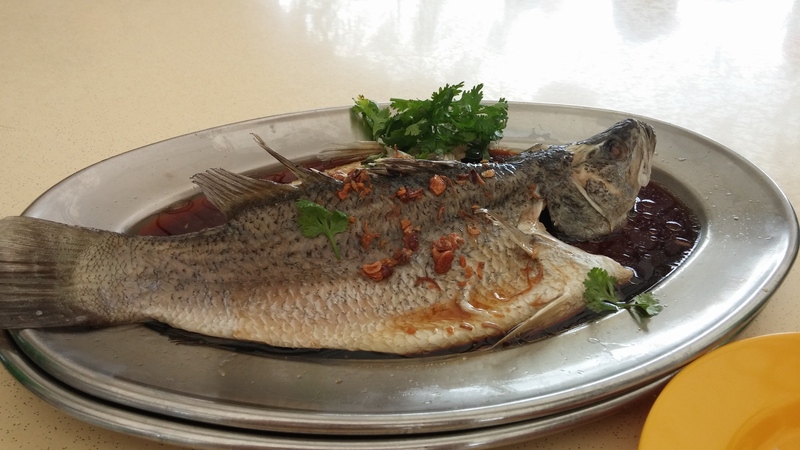 I absolutely loved the seafood as it was fresh and deliciously prepared. After an hour of feasting, we explored the other side of the island –vmore greenery, trails, and more rain water filled quarries. The afternoon heat made cycling a drag and we decided to return the cycle to the shop and head back home. We didn’t have to wait much long for the bumboat return ride and were back on the other side in about 15 minutes. The day trip was rewarding for our air-con bred bodies that for a change inhaled fresh air and our eyes had a good break from the computer screen. The island is good for cycling. There is also an area for mountain biking – which we didn’t explore. Overall it was a good break from our routine life. Bumboat ride per person per way is SGD 2.50 (per person). So SGD 5 for a round trip per person. You have to pay directly to the bumboat owners at the beginning of each way trip. The bumboat carries 12 people and it only leaves when they have that number onboard. Or else you can pay SGD 30 and take the boat to Pulau Ubin. There is no proper timetable for the ferry departure. The island opens from 8:30 am to 6 pm every day. You can choose from a variety of bicycles. Do not forget to bring in cash as cards are not accepted in the island. Try to reach as early as possible to avoid the heat. You can get your own cycle from Singapore on the bumboat by paying SGD 2. Wear sunscreen, comfortable clothes, sunglasses and sneakers. You may also carry mosquito repellent, especially if you are camping. Carry water. Although you can buy at the vending machines located island wide. 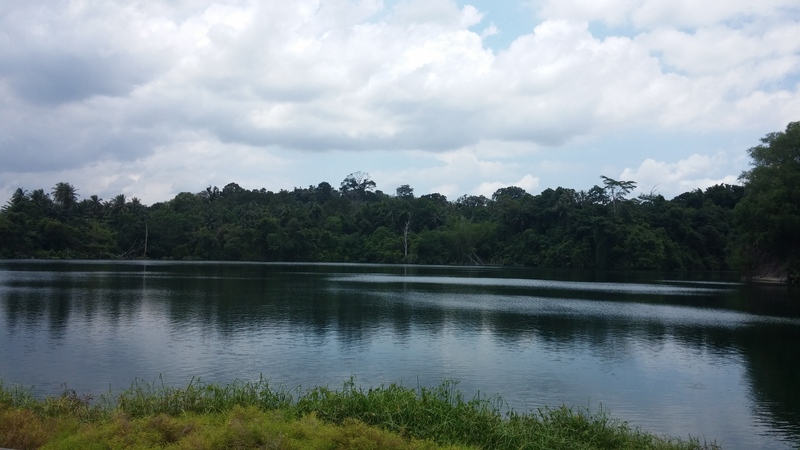 This entry was posted in Singapore Diary, Travel and tagged Forest trail singapore, pulau ubin, singapore, Singapore expats, singaporean food, travel, Traveling, weekend getaway. Bookmark the permalink. Hi! I am a fellow food blogger. I like your blog. This post is very informative. I need a review on Korean fried chicken especially Four fingers. What do you think of it. Please let me know if you have tried it.